FROME campaigner, Lisa Wells, has been awarded the UK’s JustGiving’s ‘Crowdfunder of the Year’ for her dedication to supporting those affected by cancer. Diagnosed with terminal bowel and liver cancer in December 2017, shortly after her youngest daughter was born, Lisa has since dedicated her time and energy fundraising, not only to leave a legacy for her two young daughters, but also to support others in her situation. Lisa, along with her friends – #LisasArmy, participated in a series of fundraising challenges to help provide financial security for her daughters and raise money for Dorothy House Hospice Care. Lisa set up a JustGiving page to raise awareness of her cause, and to date, they have raised £84,857. 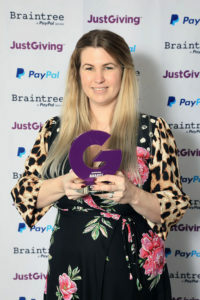 At the annual JustGiving awards, Lisa took home the trophy for ‘Crowdfunder of the Year’ at a ceremony in London on Tuesday 20th November. On her Facebook page, Lisa wrote, “I’m absolutely humbled to have won the award for top crowdfunder. None of this would have been possible without the incredible love and support that all of you have given me. Every share of my story, every penny donated, every fundraising event that you all did for me. I cannot thank you enough.